If I use Chrome no problem. QuickBooks 2015 – update – This company file needs to be updated. Please ask you Quickbooks Administrator to update the files. We got a call for this issue. The client upgraded from QuickBooks 2012 to 2015 on two machines. After that they were unable to open their two company files. I upgraded the copy on their server. That wasn’t a total fix. I found the admin account in some documentation. Didn’t know the password but was able to reset it. After that we opened the company file with the admin account. The file updated itself and after that the QuickBooks file was good to go. I hope this help someone out there…. We had a couple of customers that got Genieo on their machines and needed it removed. Another tech advised to use this link’s instructions. Make sure to reset the browsers to clear out any unwanted effects from the program. This link is very detailed about cleaning up the browser. Youtube video where the person uses “App Cleaner” to remove the program in less than a minute. We were installing a new installation of Joomla 3 on our Godaddy shared hosting account. The PHP magic quotes was set to on and we needed to turn them off. We made changes to the htaccess.txt file because of an article we found that suggested this. We made the change but still won’t install. We need to restart php after the changes were made, but didn’t know how to do this on shared hosting. We called Godaddy and while on hold I found the answer. I want to work with one of Google’s maps API. It requires an API key. It took me a bit to find the information. This page helped me obtain the key. This page is where I created the key. WebsiteBack Company Invoice – is this a scam? We have some customers that have received invoices from WebsiteBackup.com for $70.00. The customer had never done business with this company before. I thought it might be attached to their hosting account when they signed up, but it wasn’t. I did a search for “Websitebackup + scam” and found a bunch of hits. Below is one…. The best way to embed a google map into Joomla. Search for the address in Google maps. Click on the Setting gear. 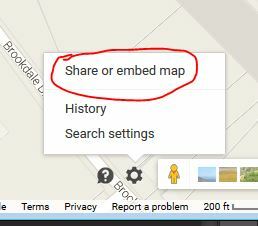 Select “Share or embed map”. Select “Embed map”, and copy the Iframe code. Install some kind of code embedding plugin into Joomla. I used Sourcer. I hope this helps someone out there…. This is something that seems to change often. I had to login the following site. Create a project. Once in the project I selected the “APIs and auth” in the menu on the left.